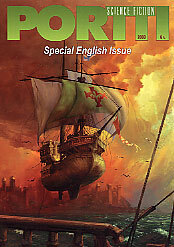 Portti is a science fiction and fantasy magazine. It is published by the Tampere Science Fiction Society, a non-profit association founded in 1979. The first number of the fanzine was issued in 1982, and since then 85 Finnish language numbers have been published — over 10000 pages altogether. Portti contains original Finnish short stories plus stories translated from the main European languages, articles, cartoons, sf news, video/dvd and book reviews. Although actual science fiction books are not published in Finland in any great abundance, the present field of science fiction writing is rather active. The Tampere Science Fiction Society has annually organized national short story contests since 1986, and the writers’ eagerness to participate has been considerable. In some years the number of short stories in the contest has reached up to over 400 stories. Several of the successful participants of the Portti contest are nowadays valued authors. This is the first Special English Portti. For it, some short stories and articles have been chosen from good writers; each writer is briefly presented in connection to her or his work. We regret that within the limited number of pages, only a very small part of the available short story and article material can be published here. The magazine also includes a cartoon from one of the best known Finnish cartoonists. Two articles review Finnish science fiction literature from the late nineteenth century to the present; combined they give the widest overview so far published.